To celebrate the fact that I now have internet at home (it's only been 15 months without) I thought I'd post the recipe for one of my favourite cakes. This one takes a bit of effort, but is definitely worth the sweat. 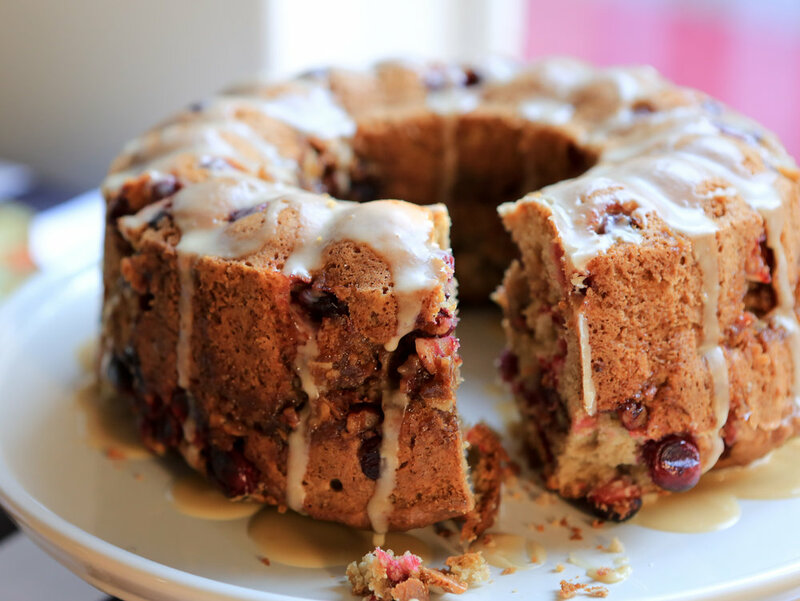 The cake is more difficult to make in winter as the frozen cranberries freeze the batter making it very difficult to spoon into a cake tin. Note, this recipe uses many bowls. Toast chopped pecan nuts in the oven - do not burn! Add the sifted ingredients (bowl 2) to the buttery sugar mixture (bowl 4). Then fold the tossed cranberries (bowl 3) into the batter. Pour a third of the cranberry batter into the tin (bowl 2, 3 & 4 mixture). Top with half the pecan crumb mixture (bowl 1), then half the remaining cranberry batter, then the rest of the pecan crumb mixture and end with the remainder of the cranberry batter. Bake for 1 hour on 170°C, or until a skewer inserted comes out clean. Once the cake is cool, sift the icing sugar and mix with the maple syrup to make a runny glaze and drizzle over the cake. Recipe adapted from a cake featured in a Woolworths Taste magazine many years ago.